Laparoscopic surgery has become the preferred approach for a wide variety of intra-abdominal pathology. As a result, hundreds of thousands of laparoscopic procedures are undertaken in the USA every year. For example, approximately 500,000 laparoscopic cholecystectomies and 200,000 laparoscopic gastric bypasses alone are being performed yearly. Surgical complications such as wound infections and postoperative bleeding account for nearly half of all surgical adverse events and many of these are thought to be potentially preventable. This checklist has been developed by SAGES and AORN to aid operating room personnel in the preparation of equipment and other duties unique to laparoscopic surgery cases. It should not supplant the surgical time out or other hospital-specific patient safety protocols. 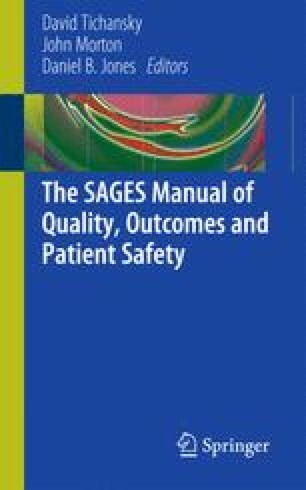 For equipment problems during laparoscopic cases, refer to the SAGES Troubleshooting Guide (www.sages.org/publications/troubleshooting/). WHO. Patient Safety: Safe Surgery Saves Lives. 2009. http://wwwwhoint/patientsafety/safesurgery/en/indexhtml Acccession date 7/15/2011. SAGES. The Society of American Gastrointestinal Endoscopic Surgeons Laparoscopy Troubleshooting Guide & Operative Checklist. 2010. http://wwwsagesorg/publications/troubleshooting/ Acccession date 7/15/2011.